Who won Australia or Kiwis in the final ? bolero wrote: Who won Australia or Kiwis in the final ? Yes. Came to know later. baggygreenmania wrote: Opals giving England a basketball lesson even without the incomparable Liz Cambage. Someone tell me why she was ejected from the game? This should be Australia's final gold medal of the Games. you don't give the men a chance? Last edited by baggygreenmania on Sun Apr 15, 2018 12:01 am, edited 1 time in total. Our wheelchair athletes have taken out the double in the marathon.. Unbelievable!!!! Katto can you process to here the post match inteview Kurt Fernley gave on 7 Plus after marathon win please. We have had a bushfire emergency here so missed marathon. How did our girls go? Boomers should not be taking foot off throat of Canada. baggygreenmania wrote: Katto can you process to here the post match inteview Kurt Fernley gave on 7 Plus after marathon win please. baggygreenmania wrote: Boomers should not be taking foot off throat of Canada. Then they should have sent a full strength team. Aussies win Squash Doubles.. Palmer and Alexander. Great work. Is that our final gold or can our Rugby Sevens girls win our last? They have gone off the boil since winning gold at Rio. Last edited by baggygreenmania on Sun Apr 15, 2018 5:09 am, edited 1 time in total. Aussies win Squash Doubles.. Palmer and Alexander. Great work. Is that our final gold or can our Rugby Sevens girls win our last? how could they send a full strength team in the middle of the NBA season where they're getting paid millions? baggygreenmania wrote: Then they should have sent a full strength team. What happened to loyalty and patriotism over the mighty buck. at what point in history did that ever exist? Australia’s first dual Paralympian/Olympian and Commonwealth Games TT player Melissa Tapper is one exceptional elite athlete . Last edited by baggygreenmania on Sun Apr 15, 2018 9:53 am, edited 1 time in total. Final medal count.. Australia first.. the rest..daylite. The most pleasing aspect of the Aussie dominance was that our victories were spread across many sports. Hats of to our outstanding athletes and to all CG athletes. You have made this quite possibly the best Games ever. India were impressive in parts and showed their punch in sports where they are dominant. 2. Swimming and cycling.Besides Srihari, India were nowhere in contention in the sports that give the max medals. 3. Gymnastics Aruna Budda Reddy reached the finals, but India missed Dipa Karmakar badly through injury. Potential gold medallist, she rested herself for Asian Games. 4.Athletics Once India.was formidable in events like 4X400 women's relay.Was poor this time round with PT Usha prodigees like Tintu Luka and one more athlete forget the name pulling out resting for Asian Games. Australian swimming and track cycling remains strong with excellent depth. Our track athletes struggle against the Caribbean and African nations mostly but there have been some encouraging performances..and PBs across several events. The greatest improvement and where we could push for world prominence in the next decade is in field events. Great prospects in Kurtis Marshall (pole vault) Brandon Starc (high jump) Nicola McDermott (high jump) Nina Kennedy (pole vault) Mathew Denny (hammer). Our shooters punched above their weight as did our divers. The hilites for me was the Aussie win in the Mixed Triathlon, 16 year old Isis Holt streeting the field in the S8 100m, the girls 4+100 free relay, boys 4+200 free relay. The lowlite was the closing ceremony. bolero thanks for making this a worthwhile thread. Square Cut and Katto too. Last edited by baggygreenmania on Sun Apr 15, 2018 10:06 pm, edited 1 time in total. Thanks in making it a good thread Baggers, Katto Squarecut and others. More than the medal count, I am enthused by the fact that some of the medal winners, especially in shooting and badminton were world class and would stand chances of winning medals in Olympics too. Indian javelin thrower winning the gold- this to me is a standout performance of the games by an Indian in my opinion. As mentioned by me earlier in the thread, it appears that Indian sportsmen are finally taking the additional efforts that is required to be world class, instead of just being satisfied with qualifying for the events, which used to be the case in the past. The fact that Indians can look forward to sports other than just cricket and find their players doing well is a good feeling. Hopefully things will get better in future. I enjoyed following th events. In fact, my knowledge on several sports and their players improved a good deal as a result. bolero wrote: Thanks in making it a good thread Baggers, Katto Squarecut and others. Boycs, Raja, Tinsel, verity, loose halo and Mike were conspicuous by their absence it must be said. Boycs was the biggest surprise not cheering on his beloved England and making lame excuses over the total humiliation at the hands of a rampant Aussie team. Last edited by baggygreenmania on Sun Apr 15, 2018 10:03 pm, edited 1 time in total. SJW fest? The fact the athletes were barely seen irked me no end. Too much talk by officials while the show was amateurish to say the least. 5 out of 10. The Closing Ceremony has copped huge cricticism here. Specially the snubbing of the athletes. CCGO CEO Peter Beattie apologised saying of the CCOC "we stuffed up". They really stuffed up by using an American PR company to put on the abysmal cereony. I recall the excellent job Ric Birch did with the magnificent Opening and Closing ceremonies in Sydney 2000. Has done similar before and since. What happened Beattie is he too expensive these days? At least use an Aussie company or a company associated with the Commonwealth. Poor show. Due to the snubbing the Aussie athletes will now be given a parade next month. Is this a way of saying sorry for the humiliation and embarrassment? At the same time the execs of the PR company should be put in old fashion stocks and pelted with rotten veggies. Last edited by baggygreenmania on Tue Apr 17, 2018 11:37 pm, edited 2 times in total. Kinda sorry the show is all over as it was most enjoyable. Gold Coast hold your head high as this was a Games of which Australia can be justly proud. Much like the spectacular 2000 Sydney Olympics. Last edited by baggygreenmania on Mon Apr 16, 2018 12:14 am, edited 1 time in total. Though I have Indian roots, I am now an American, cricket is the only “Indian” sport that I passionately cheer now. I do see a lot progress in indian sports compared to yesteryears, still a long way to go for a nation of billion+ people, where sports for many meant fun & entertainment but not a career yet. baggygreenmania wrote: Boycs, Raja, Tinsel, verity, loose halo and Mike were conspicuous by their absence it must be said. Boycs was the biggest surprise not cheering on his beloved England and making lame excuses over the total humiliation at the hands of a rampant Aussie team. My intention was not to troll.. in fact the opposite. Kinda missed the others. There are other sports beside cricket. 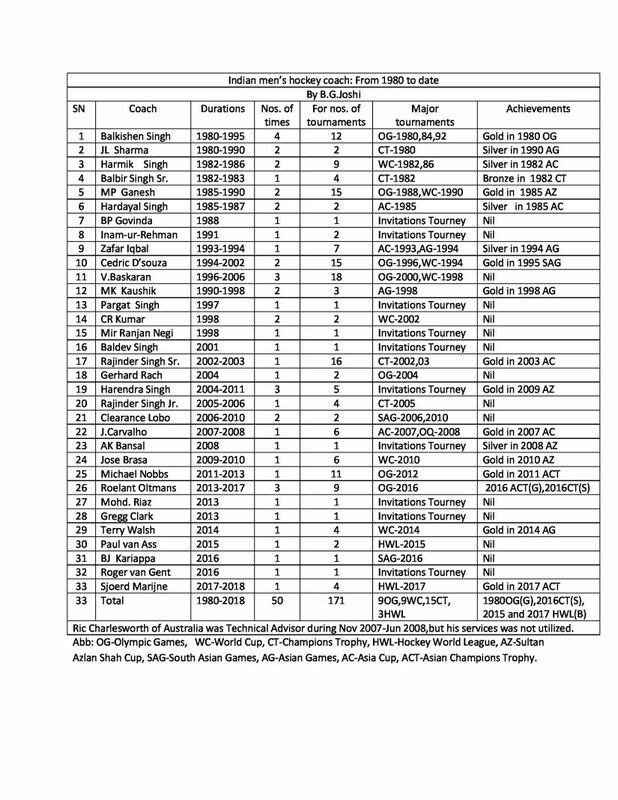 Pls see link.Some of India's top sprinters missed out. I have been looking for uploads on YT of games events as I do not own a working recorder. Only thing I could find was by an Indian uploader. That should suit you bolero. Where are the Aussie uploaders? baggygreenmania wrote: I have been looking for uploads on YT of games events as I do not own a working recorder. Only thing I could find was by an Indian uploader. That should suit you bolero. Where are the Aussie uploaders? Copyright issues.Even the Indian uploads would be cut, not the full footage. squarecut wrote: More than the medal count, I am enthused by the fact that some of the medal winners, especially in shooting and badminton were world class and would stand chances of winning medals in Olympics too. Badminton and Shooting, India are among the World's best, so not surprised. Manu Bhaker, Mehuli Ghosh, Anish Bhanwala, Elavenil Valrivan are names to watch out for in World Shooting. Veterans like Gagan Narang, Heena Sidhu and Tejaswini Sawant are nearing retirement. I wont count out Jitu Rai yet. Asian Games badminton would be a completely different proposition for Indian shuttlers as the Chinese, Japanese, Taiwanese and the Thais would play. Difficulty level would be 5X compared to Commonwealth. 1st casualty of the CWG probably. The curtains have come down on the Commonwealth Games in Gold Coast and it's time to do some stock taking in Indian hockey, notably the men's team. Two silver medals in previous editions of the CWG and not even winning a bronze medal this time hurts hockey fans. At a time when the rest of the Indian contingent, across various disciplines, impressed with adrenaline-felted performances Down Under, the Indian hockey team lacked spark. For the time being, one needs to focus on the poor results from the men's team under coach Sjoerd Marijne. To say that Marijne is new to Indian hockey would be wrong. He has handled the women's team before this and his elevation as the men's chief coach after Roelant Oltmans was sacked last year had created a buzz. What really went wrong with the men's team is going to be probed soon by Hockey India. These days, when every match is captured on camera in high definition, and slow-motion replays are available, Hockey India's "post-mortem team" will definitely be analysing what went wrong. To say that the performances Down under was an aberration would be wrong. Ball possession and penetration was there to see but the lack of a coordinated effort is worrying. The less said the better about penalty corner conversions. There is a fear in hockey circles Marijne's credentials are going to be sharply questioned. He has been given a free hand in selection matters, which probably explains the exclusion of Sardar Singh. To many, Sardar is still a valuable playmaker who should be part of the team. However, if one person can be spoken of as a good performer, it's Manpreeet Singh in the half-line. Overall, the midfield looked ragged, the frontline frayed, and in the defence, nothing to feel good about other than goalkeeper PR Sreejesh. In the old days, people said the players were not fit. These days, when fitness and speed are measured on the yo-yo scale, the players are faster. Coach Marijne has to explain why the spark was missing and drawing with Pakistan 2-2 cannot be digested. "We beat Pakistan six times before this and now a draw? Cannot be accepted," said a source in Hockey India. It was a hint, Marijne will have to come up with a good defence when the dissections take place in the Capital. Former India captain and coach Zafar Iqbal told Mail Today on Sunday: "There was just no rhythm from the first match. Against Pakistan, we should have been playing with greater zeal. To play poorly against New Zealand is not what we expected. I hope the team can regroup soon." Indian hockey is notorious for sacking coaches. Hopefully, Marijne will not meet that fate. But then, he needs to come up with big plans as India compete in the Champions Trophy, Asian Games and World Cup this year. Officials running Indian hockey have no patience. They want instant result and that too without any input. I think IHF should be run by a private organisation like BCCI instead of being run by a government organisation. You never know when you would be fired. The Closing Ceremony debacle has copped huge cricticism here. Specially the snubbing of the athletes. CCGO CEO Peter Beattie apologised saying of the CCOC "we stuffed up". They really stuffed up by using an American PR company to put on the abysmal ceremony. I recall the excellent job Australian Ric Birch (http://www.celebrityspeakers.com.au/ric-birch/) did with the opening and closing ceremonies in Sydney 2000... helping to make it the "greatest Olympics in history". Birch had made his name years earlier with the Brisbane CG and later the Atlanta Olympics. What happened Beattie is Birch too expensive these days? At least use an Aussie company or a company associated with the Commonwealth. Poor show. Due to the snubbing the Aussie athletes will now be given a parade next month. Is this a way of saying sorry for the humiliation and embarrassment? At the same time the execs of the PR company should be put in mediaeval stocks and pelted with rotten veggies. Last edited by baggygreenmania on Wed Apr 18, 2018 12:55 am, edited 2 times in total. Shove Beattie in the stocks too. Stuffed up big time hiring this American rapper PR company. I bet it wasn't the PR company's idea for all these dignitaries to have long speeches. It was the egos of self important bureaucrats. baggygreenmania wrote: Shove Beattie in the stocks too. Stuffed up big time hiring this American rapper PR company. Yanks may be best PR people in world but this hotch podge of a show was not one of its best. Beattie acknowledged the official speeches were overkill and mind numbingly boring for the spectators. Of couse the blame lies with Gold Coast. He did say "the buck stops with me". bolero wrote: 1st casualty of the CWG probably. As I predicted, Marijne has been removed as coach of men's team and made the coach of the women's team. Joke. NEW DELHI: Women's hockey coach Harendra Singh was on Tuesday made in-charge of the men's side, while men's coach Sjoerd Marijne was re-designated the women's coach in an inexplicable rejigging of roles by Hockey India following the medal-less show at the Gold Coast Commonwealth Games last month. Dutchman Marijne, who was handed the reigns of the men's team in November last year, is currently not even in India and has been sent back to his original position of women's coach after Manpreet Singh and Co's fifth-place finish at the CWG. "Harendra Singh brings with himself a wealth of experience and has previously managed a lot of the men's team players during his stints in the Hockey India League and with the junior teams," Hockey India Secretary General Mohd Mushtaque Ahmed said in a statement. "Marijne's first stint with the women's team was a very successful one and we are sure he will continue to do well with this team as he has done in the past," he added. HI didn't say it in as many words but Marijne's repositioning seems to be a fallout of India's first medal-less finish at the CWG in the last 12 years. The Dutchman did not have any past experience of coaching a men's team when he was given the India job. The decision was taken after a review of the team's performance at Gold Coast.